Melt butter in large skillet and mix in flour until smooth. Add Promised Land Dairy Whole Milk and chicken broth; stir constantly until thickened and bubbly. Add seasonings and blend into mixture. Add cubed chicken and let cool. Boil celery, carrots, and onion in 1 inch water until crisp-tender (approximately 7 minutes) and drain. 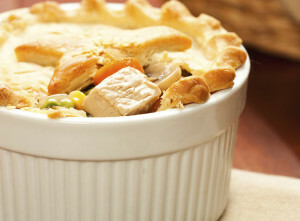 Combine hot drained vegetables and chicken mixture – mix well. Pour mixture into 9 inch pastry lined pie plate. Place top of crust over filling, turn edges over and press to seal. Make slits in top crust to vent. Bake for 30 minutes or until golden brown. Serve while hot.